Also, look at the picture of how the frame side of the trackbar has something similar to a tie rod end. 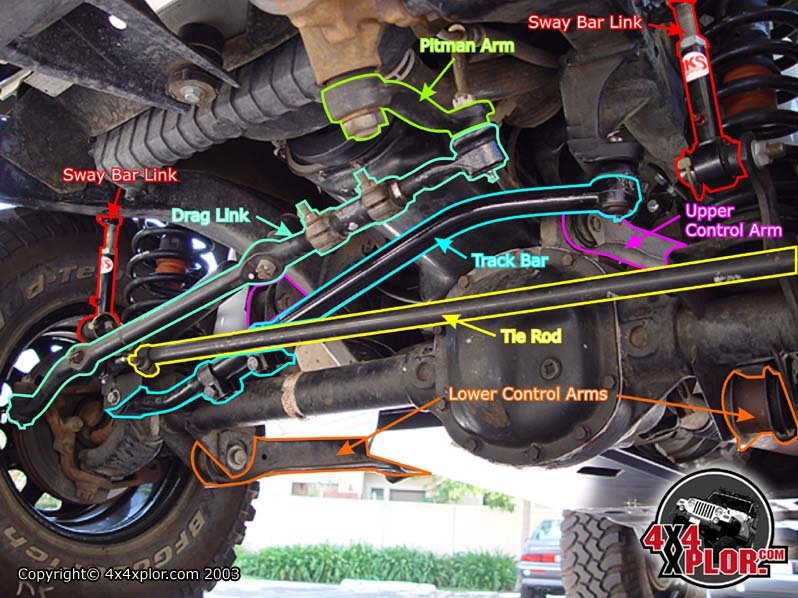 When the suspension droops in a TJ or XJ, the design of the frame side ends binds the end and can damage or break the end--leading to the scenario described above. The swaybar links (red) have bolts that can work themselves loose. This also can lead to bad wobbles. If this front end inspection does not diagnose and/or solve it, then I would move to an alignment. With all this, I highly doubt you do not find the source. The last ditch thing if there is a non-DW, speed dependent range wobble, I would borrow a different set of wheels and tires to see if it changes, and I would try driving it with no front driveshaft to see if that changes anything. Although it is always a good idea to inspect your axle shaft u-joints, they will not cause DW. Great to see you and your write up here. I think it'll be great to be able to direct people to a forbidden post instead of sending them elsewhere to read your write up.